Well, the Holidays are officially upon us. You know what that means, food, food and more food. This can be a particularly challenging time for primal folk. At home, the office, parties, we are constantly encountering enticing holiday treats, most of which we shouldn’t or wouldn’t go any where near at any other time of the year. Even when we are entertaining others its especially hard during the holidays to force our eating choices on others. Lets face it, people just have certain expectations during the holidays. I think its okay to prepare traditional holiday foods for your guests. While the temptation to stray might be greater, preparing tasty primal options will make the task easier. 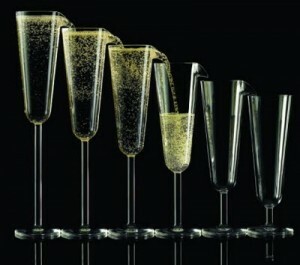 One of the biggest temptations is the array of finger foods and hor’s d’oeuvres that we are confronted with. They are just so easy to pop in your mouth without thinking. so my strategy this season is to appease my guests and myself by preparing primal option when I entertain as well as when I am asked to bring something to a friends or families. I am going to share with you 2 of my favorite primal snacks that both look great and taste great: Primal Hummus and Salami Crisps. they are both easy to make and are perfectly primal and delicious. 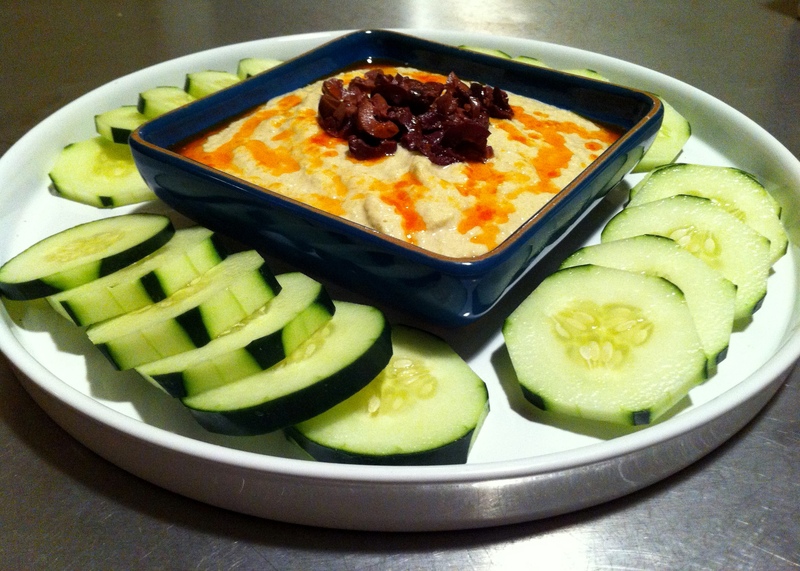 I typically serve the hummus with sliced cucumbers, but will also prepare carrot ships to go along with this hummus this season. To make the hummus simply place all ingredients, except the olives, pine nuts and chili oil in a food processor or blender (if you use a blender you may have to do this in batches). Process until very smooth, This is ready to serve, but I have found that if you refrigerate it for a few hours it will firm up a bit more. When you are ready to serve, placde the hummus in a serving bowl and drizzle with chili oil and top with olives and pine nuts. Surround the hummus with the sliced cucumber and carrot chips and serve. I sometimes use raw carrot chips but will also bake them. This is very easy especially when I buy the already cut ripple carrot ships at my local market. I simple toss the carrot chips with olive oil and season with salt, pepper and cumin and bake in a 400º oven for about 20 minutes until they are browned and crispy. This makes a good amount of hummus so you may have left over. I like to use the left over for salad dressing. To prepare the Salami Crisps preheat your oven to 400º. Place the salami on foil covered cookie sheets in a single layer. Place the salami in the oven and bake until brown, about 15-20 minutes. Watch them closely to ensure even browning, re-arange if necessary. 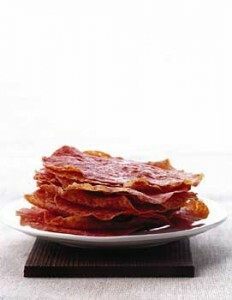 Remove the salami crisps from the oven and place on paper towels to absorb extra oil and allow to cool. When they are cooled and you are ready to serve, place a small dollop of sour cream on each crisp and sprinkle with some sliced basil. Thats it! I hope you try these delicious snacks for your next holiday party. Enjoy!